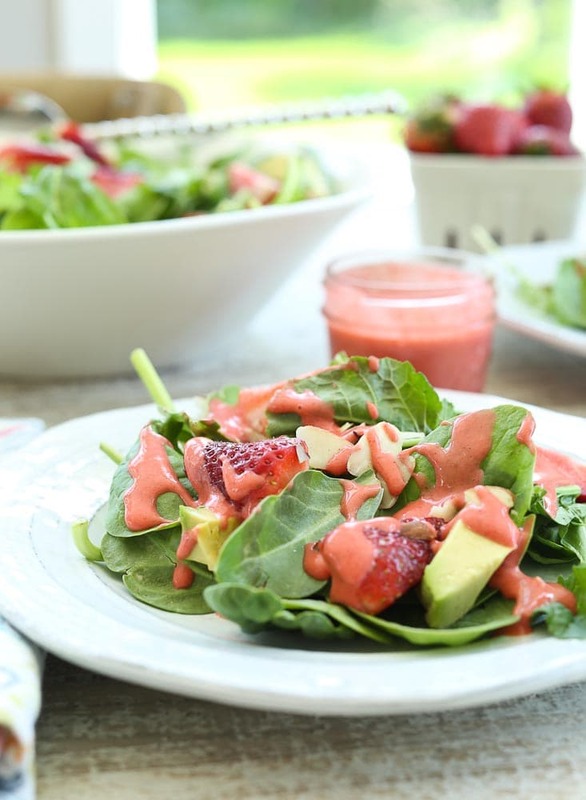 This Strawberry Spinach Salad with Avocado and Strawberry Vinaigrette Dressing is light, healthy, and super quick to prepare! You’re going to love this salad recipe. 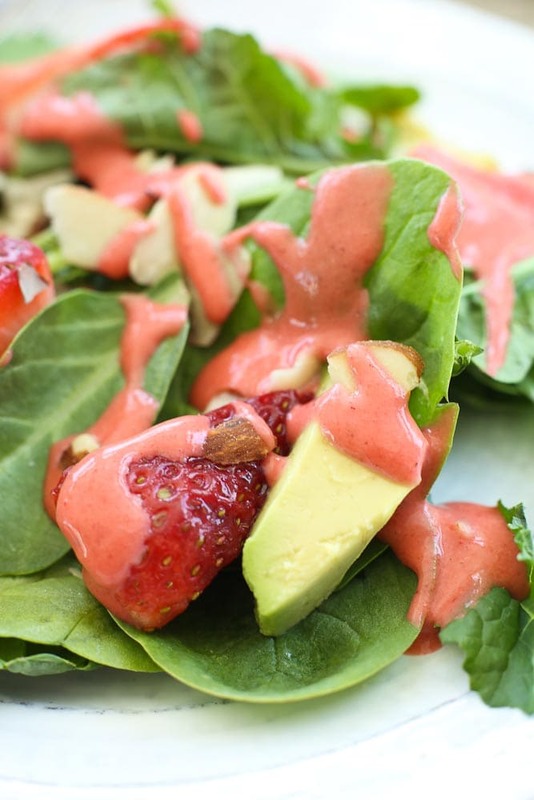 Every girl needs a go-to salad recipe that is equally easy to make and impressive. One that she can throw together in 10 minutes to add it to dinner, bring to a social event, or make a quick lunch. This is that salad. With minimal chopping, you can throw the salad portion together in about five minutes. 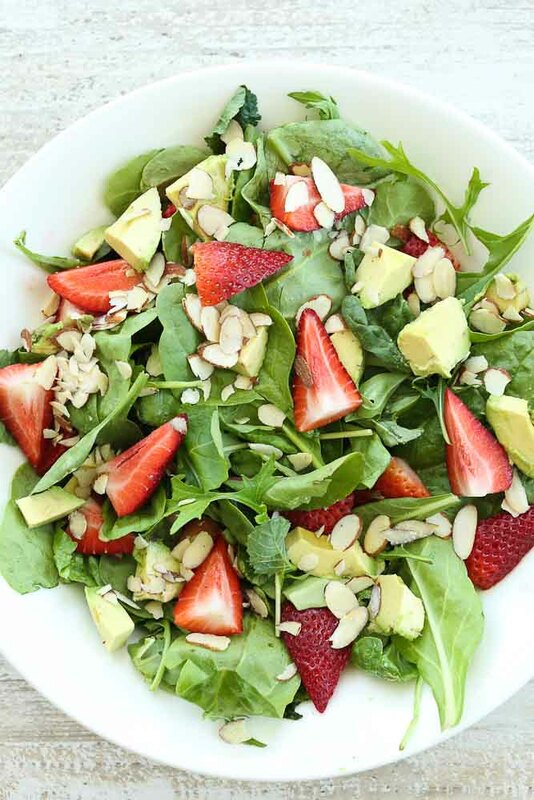 It’s got all the usual players you find in a Strawberry Spinach Salad (spinach, strawberries, almonds) with the addition of avocado. Avocado always make a salad better, no? 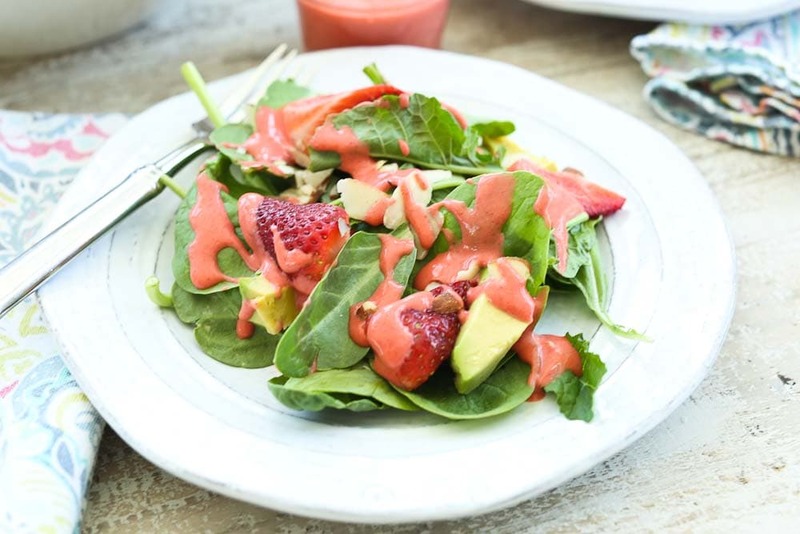 Then there’s the Strawberry Vinaigrette Dressing. 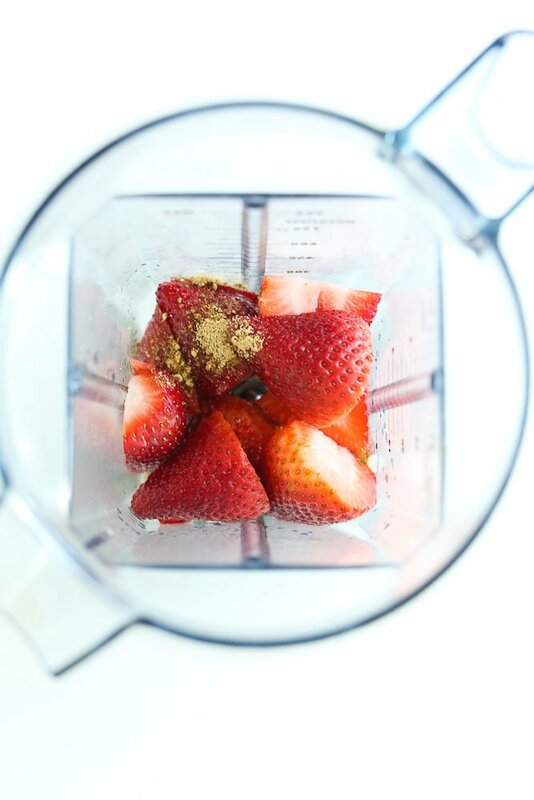 It’s as simple and putting a few ingredients in the blender and blending until smooth. We’re talking maybe another five minutes. This is what adds the impressive factor to this salad. That color! The flavor is tangy and light and it tastes great on the salad. You only have to invest ten minutes into this salad. Busy moms, can I get a HELL YEAH? I should also add that you can make this with all spinach, or a mix of spinach and other greens like you see in the photos. 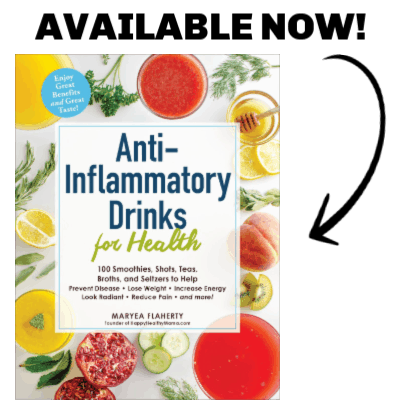 I made it with a power greens blend. I like to get as big of a variety of greens as I can, so I usually get a blend rather than all spinach. 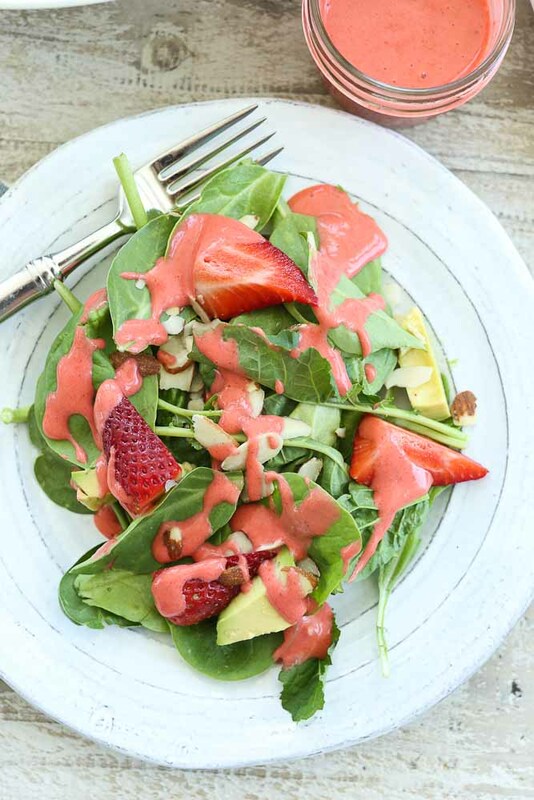 This Spinach Strawberry Salad with Avocado and Strawberry Vinaigrette is super quick to make, healthy, and delicious! Put your spinach leaves in a large bowl and season with salt and pepper. 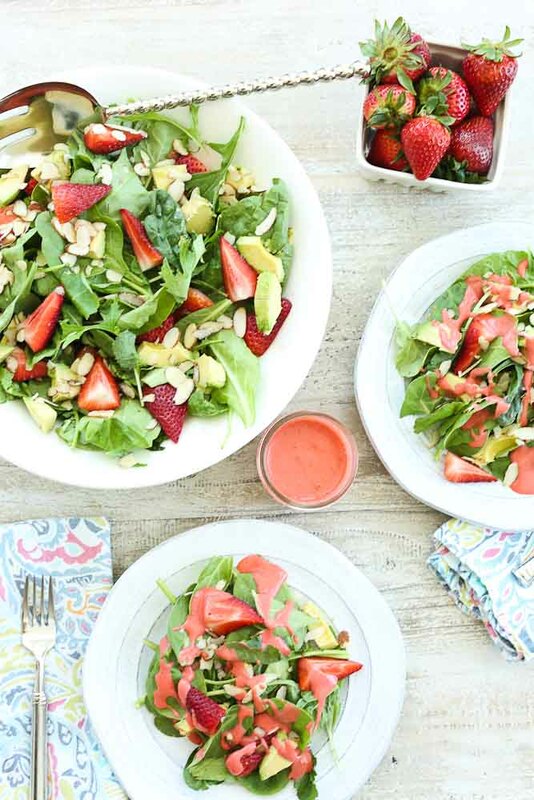 Add the strawberries, avocado, and almond slices. 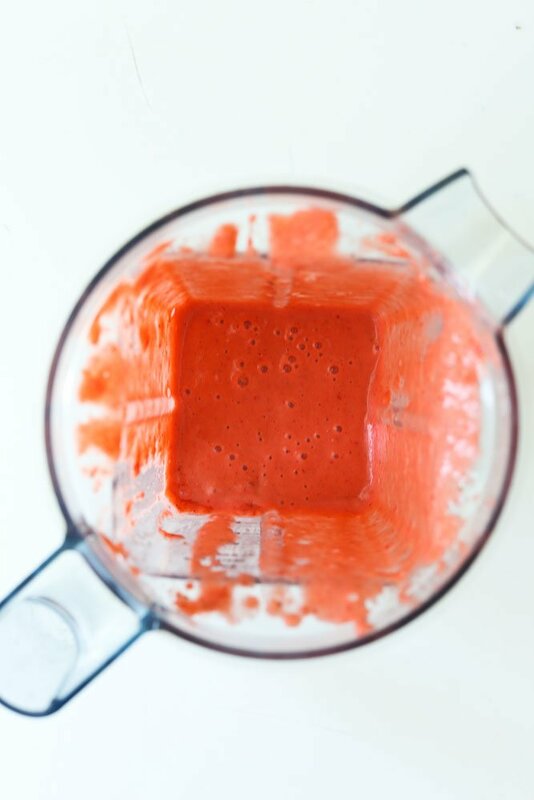 Meanwhile, Put all of the dressing ingredients into a blender and blend until smooth. Serve the salad with the vinaigrette dressing. If you make this or any Happy Healthy Mama recipe, I would love to see it! Snap a picture and tag me on Instagram or Facebook! This recipe looks amazing! Your photographs are stunning too!